Minkie had a day of quality yard time last week- front and back, both! She could not have been happier. She and Daddy played tag in the front yard. Her version is to run a little and then fall down, laughing like crazy. She then realized she loved rolling around in the grass. Her hair was a bit leafy. I took her into the backyard and she quickly discovered a tiny, long-forgotten potted plant, some kind of succulent. It was dried and the roots did not hold it in the soil, so when she turned it over and shook it, the soil and plant fell out. I helped her stuff soil back into the little pot. Then she climbed into her play structure (about a foot off the ground, with a slide), sat down on the platform, and proceeded to dump out and re-stuff the soil into the pot. Her hands were covered with dirt; it was wedged under her nails. I looked at my little nature girl. 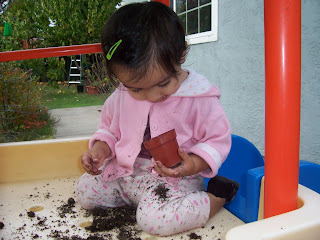 I had to stop myself from taking the dirt and pot away from her and brushing her off-- I had to remind myself to let her play. I remembered when I worked one summer as a cashier at a Very Nice Department Store, in the Very Nice children's shoe section. A girl found a pair of sneakers she liked and ran around with them on, delighted. I liked watching her have such a good time-- until her mom or caretaker said sharply, "Come here and sit down like a lady!" Minkie may have a leaf in her hair and dirt under her nails. There may be a time when I forget to relax and let her have fun; I may take away the dirt before she's ready, just because I've forgotten that fun is more important in that moment than perfect grooming. But that day, I'm so glad I remembered in time.